Martin. – Dirty wet dog , boats and sailing. Today is/was the day after my first pay-day as a registered nurse again and there was a small but useful increase in my salary : i did think about keeping that extra amount back towards some soon essential dentistry or even towards the car MOT and service coming up…..of course what i actually said was “f**t it” and spent it on the boat. Later this week i will write up about the new anchor bought today and what i think will now be the primary/bower anchor. So today that occasioned a drive down to the city mainly to hit the chandlery : that really meant parking in the marina car park which is mostly now boat storage. It was a horrible wet and grey morning down there although i did take some photographs of power boats for another website : after that i went for a wander around the boatyard there just to see if there was anything remotely interesting there for the blog. I can’t say i had high expectations as its the kind of marina and yard that really caters to the big generic (boring) cruising and cruiser racers. 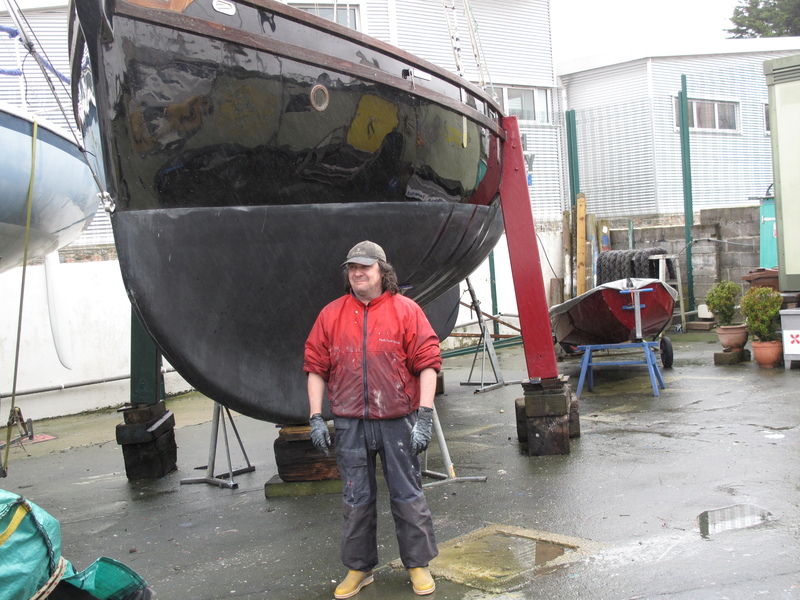 There was a bloke there doing something wet and dirty under a cruiser-racer : he looked exactly like i used to in my boatyard days : basically damp and filthy. In the yard corner though a streak of black hull and black topsides caught my eye and my mind immediately went back to Brittanny and Eric Tabarly’s series of all black boats named Pen Duick. The boat stands out like….something that really stands out, as she is essentially a converetd Falmouth working fishing boat, i believe one that had been used in the oyster fishery there. It was really difficult to get the angle to get any decent photograph but just to say that she is around 30 feet on deck, comes in at 8 tons but in sailing mode she has an extra 17 feet of bowsprit sticking out the front and a long boom that overhangs the stern. Martin : her owner has spent 5 years bringing her up to an immaculate standard not visible in the few pictures i took , her spars just as an example look as though are very clear spruce with nicely made stainless steel fittings. Down in Falmouth these are genuine working boats, usually with a long open cockpit and their purpose is to dredge for oysters during the season, in fact from memory there is a local byelaw there that only allows for oyster dredging under sail. They often race too and with their big working gaff rig and topsail quite often outsail all the modern boats : that was certainly the case when i watched a race one evening. Of course the other factor is that their owner/skippers are born and bread sailing seamen and do it for real every working day. Martin was a lovely bloke to talk to : cheerful on a miserable day, he really suits his boat but sadly she is up for sale and way outside my budget.